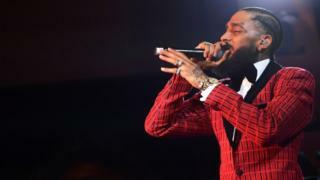 Social media still dey go gaga afta tori land since Sunday evening say African-American rapper Nipsey Hussle die for gunshot. Di 33 year old Grammy nominated rapper die from multiple gunshot in front of him clothing shop wey him call Marathon Clothing. Di suspect wey dem never find also injure two pipo. Di Los Angeles Crisis Response Team confam am for tweet. Plenti artists including Drake, Rihanna and J Cole don pay tribute to Nipsey Hussle wey. Drake describe am as "a man of respect and a don"
"Rhihana write say di tin shake her spirit. Diddy for im tribute say Nipsey "represent change, im represent evolution, im represents everytin our culture needs to embrace". Im die leave behind s girlfriend, actress Lauren London and two children. Nicki Minaj tweet say Grammys Ken Ehrlich bully her, she don keep "quiet for 7 years sake of fear"